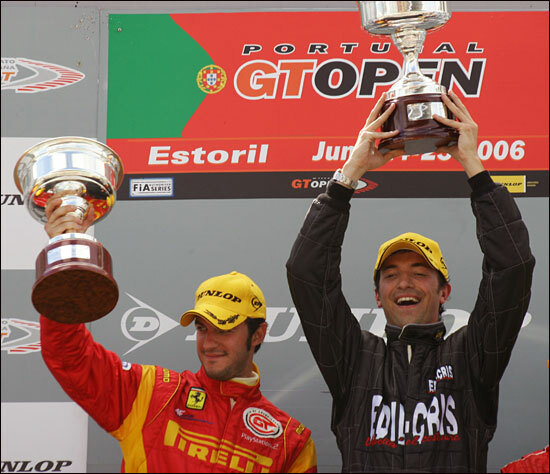 After a promising beginning at Monza at the beginning of April, and then more good racing at Magny-Cours at the end of that month, the new-for-2006 series resumed at Estoril on June 24-25 – with a 31 car grid for the GTA (GT2) and GTS (GT3) races. Ferraris took both victories – Montermini and Bastos in the GPC 360 in Saturday’s race, Ruberti and Bobbi in the Edil Cris 430 on Sunday. Ferraris had certainly dominated qualifying for the Saturday race, filling the top six grid positions – in the order Ruberti and Per Guidi (Playteam 430), Manuel Giao (Playteam 360) and Montermini, then two more 430s on the third row (Peter Sundberg in one of them, the Icer Brakes Le Mans Series car, Luis Sala in the other). The fastest Porsche was down in tenth, while Gianluca Roda was down in 20th in his Autorlando Porsche (although ‘only’ four seconds off the pace), this one running smaller restrictors than the Spanish GT cars. Paolo Ruberti led from the start in the black 430, from Sundberg, Giao and Perez Aicart in the first non-Ferrari (the Mosler). The MT900R was struck by Michele Bartyan on lap 8, the American car spinning, while the Italian one suffered that classic Porsche problem, a damaged cooling system – the water leak onto the front tyres sending it into the gravel. Per Guidi would have to start this one from the back of the grid on Sunday, as a penalty. Cor Euser took over fourth place in his LM600, but he lost part of the contents of his oil system, leaving that position to 2005 FIA GT Champion Gabriele Gardel (it does attract the names, doesn’t it?) 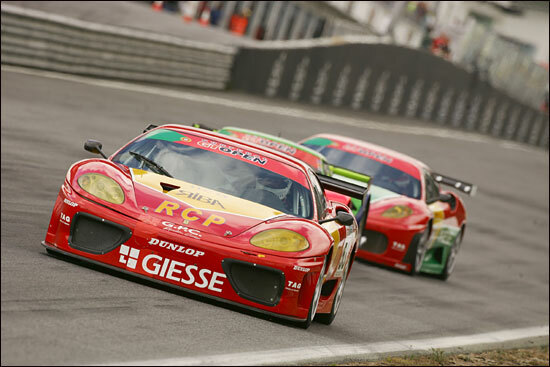 in a GPC Ferrari 430, who led Miguel de Castro (Drivex Porsche) and the recovering Perez Aicart. Pit stops for the driver changes began 12 laps into the 26 lapper, and the fastest cars were held longer than slower ones – so once the order had settled, Ni Amorim led in the Playteam 360 vacated by Giao, from former FIA GT Champion Matteo Bobbi, in the car that Ruberti had used to lead the early going. Amorim and Bobbi made contact on lap 20, the former dropping to third – Lambertini, in the Gardel 430 taking over second. The drama was still to come, Lambertini spinning on lap 23, then Bobbi pitting with a suspected puncture – so Amorim led again, but after a great last lap dice, he had to give best to the Ferrari 360 of Andrea Montermini (below). 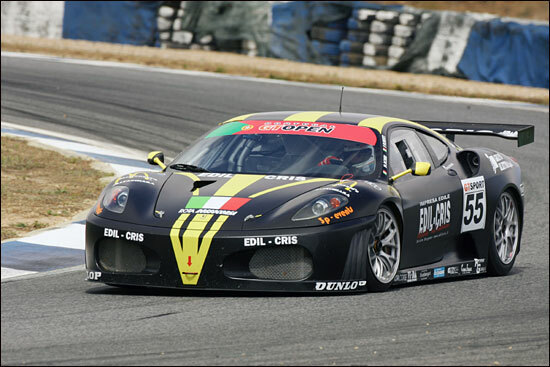 So despite six Ferrari 430s in the field, 360s finished 1-2. GTS saw a great finish too, the Viper of Zonca and Belicchi heading one BMS DBRS9 (Zani / Malucelli) by a second and a half, the other (Groppi / Seiler) by 10 seconds. The separate (alos 26 lap) race for the GTB and GTC cars was more like a Spanish (GT Championship entrants) event, with just 14 cars starting. Jose Vaz Guedes and Francisco Cruz took the win, in a Porsche GT3 Cup. Paolo Ruberti and Matteo Bobbi almost certainly formed the strongest pairing at Estoril, and they duly took the win in Sunday’s race, in the Edil Cris Ferrari 430. Other new Ferraris finished third (Gardel and Lambertini), sixth (Per Guidi / Bartyan), seventh (Cerqueda and Sala) and ninth (Espirito Santo / Bravo). But Bobbi didn’t have it all his own way from the start: Miguel Cristovao, starting Euser’s big Marcos LM600, passed the Ferrari on lap 1 and led until lap 7, when the Italian got by at the hairpin – and pulled away from the Portuguese driver. There was some entertaining racing behind these two, initially between Guerrero in the Escuderia Bengala Mosler and the Ferrari 430 of Javier Diaz – but they made contact at the end of the opening lap, Diaz spinning down the field. Guerrero then raced hard with Michele Maceratesi in another of the Playteam Ferrari 360s and Jordi Gene in the SEAT Cupra GT. If you can keep up with the team and driver names, it was very entertaining – behind this group too, where more Ferrari 360s were dicing with the Mosler of Villalba. Ruberti (above) led from Euser after the stops, from Aicart’s Mosler, Giao’s 360 and Gardel’s 430. Euser finished second on the road, behind the Italian, but was penalised by a lap for leaving the pits too soon at the driver change. Matteo Bobbi (below left): "It was great to race with Paolo Ruberti here. We were fast everywhere on the track: a shame only for the problem in race one, but I'm satisfied for the win in race two. 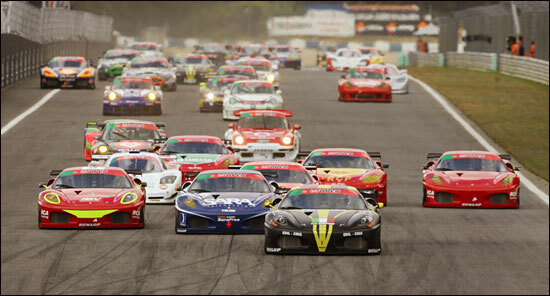 Now it's the time to look forward to the upcoming FIA GT round at Oschersleben." Aicart spun away what would have been second (he finished fourth), leaving P2 and P3 to Giao and Gardel. Somehow, the organisers have created a level playing field for most of the GTA cars – although the Porsches are all struggling, the best-placed one being the de Castro / Burgueno example in fifth. GTS became a Racing Box Viper 1-2 (Zonca and Belicchi again, from Perazzini and Cioci), although Zani in the BMS Aston Martin had led these two until just before the end. There’s a pause now for this series – the next pair of races taking place in Istanbul, towards the end of September.